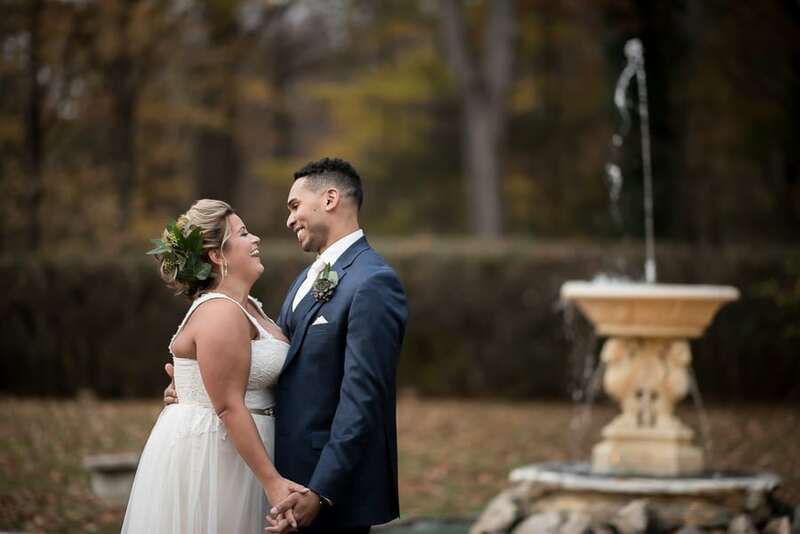 Alexis and Ron’s Greystone Hall wedding fell on a chilly November day. We met Alexis and her bridesmaids at the Sheraton Inn where they were getting ready. Since five of the girls are stylists, they took turns doing each other’s hair and makeup. We grabbed a few pics of them in their satin robes before moving on to details. Alexis’ sheath style gown was very light and flowy with a gorgeous beaded and satin belt. Her bridesmaids wore full length gown in blush and beige and they were ready to have fun. I snapped a few pics of Alexis getting into her dress before heading over to the Greystone Hall wedding venue. Once the girls arrived at Greystone, we grabbed her bouquet from Sweet Pea Florists and took Alexis to the amazing mansion stairway. The stairway is overlooked by stained glass windows and makes for the most gorgeous lighting. Alexis looked just flawless; her dress fit perfectly and I loved the magnolia leaf headpiece she wore. Her bouquet had roses, peonies and anemones in various shades of pink. She laughed when I asked her to dance around in her dress, saying that was the most girlish she’s ever been. What better day than your wedding to by ultra girly! Ron and his groomsmen arrived next so we met them in the library. 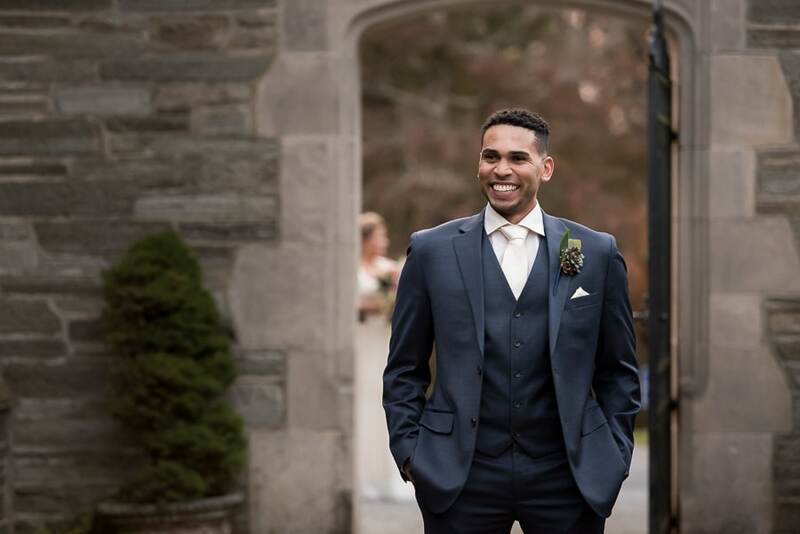 They wore navy suits with blush colored ties and brown shoes. I could tell Ron was so excited. The guys put on their succulent boutonnieres from Sweet Pea Florists and then I took Ron off for the first look. 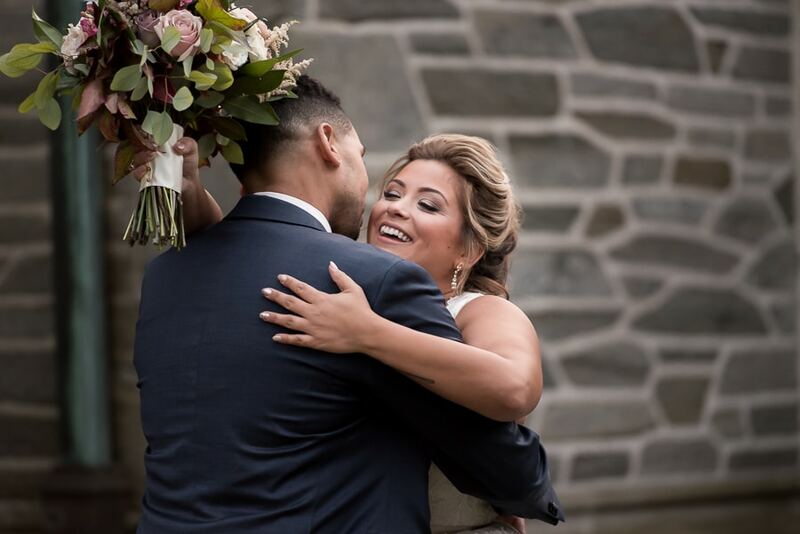 Alexis and Ron couldn’t stop smiling when they saw each other…it was such a sweet moment. We did a few portraits before moving on to bridal party formals as we were losing the light. The large group was really fun to work with and troopers about being out in the cold as the sun went down. 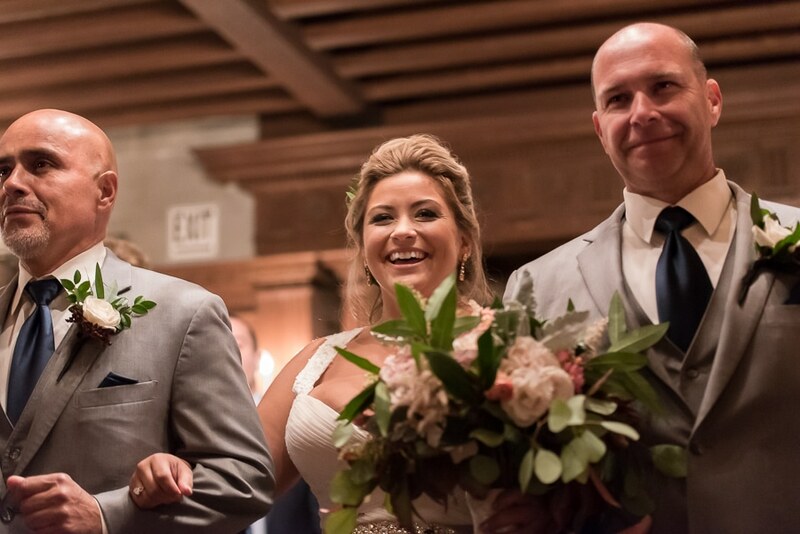 Alexis and Ron exchanged vows in the Great Hall. This was my first time shooting an indoor ceremony at the Greystone Hall wedding venue. What a great space! 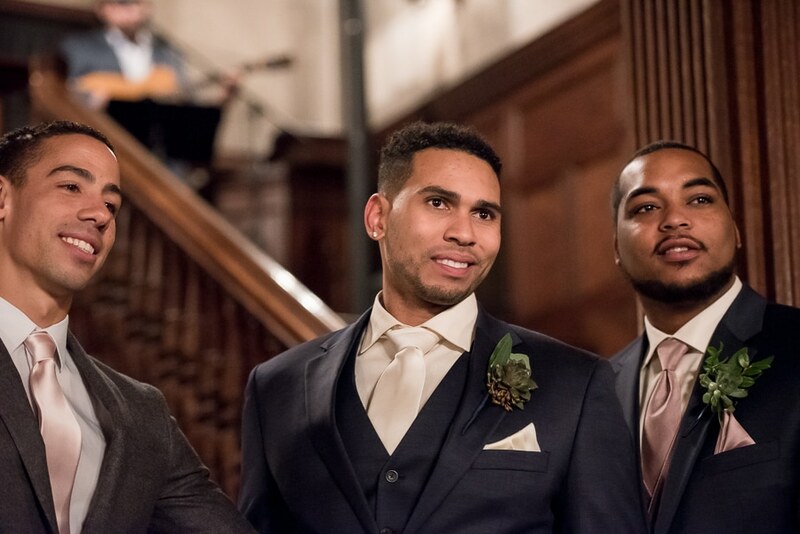 The couple chose to have a simple ceremony officiated by their friend, PK. 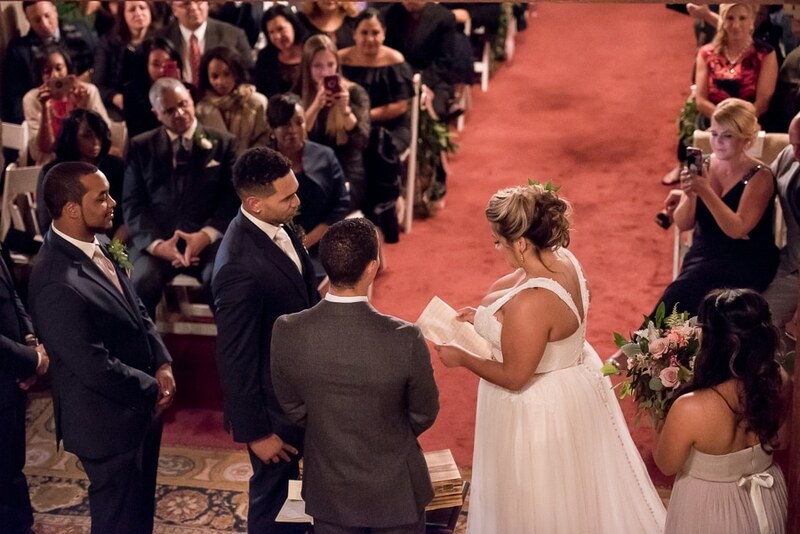 Many happy tears were shed during the couples self-written vows and you could really feel the love coming from the family and friends. After the ceremony, guests set off to cocktail hour. The main bar was in the Iron and Glass Palm Room overlooking the North Garden. While we made quick work of family formals, guests enjoyed butlered hors’ d’oeuvres by Sage Catering. After family formals, we shot the reception area; the Tent-Pavilion was lit by small twinkle lights along the perimeter and highlighted by two beautiful white lanterns on either side if the Great Hall doors. Iron lanterns and vases full of succulents served as beautiful centerpieces of the guests’ tables, while magnolia leaf garland accentuated the sweetheart table. When it was time for dinner, guests were ushered into the tent. The DJ from Xclusiv Entertainment settled down the excited crowd so he could make introductions. After parents made their entrances, all the bridesmaids came out dancing, followed by all the groomsmen. Alexis and Ron then made their debut to Wifey by Next. 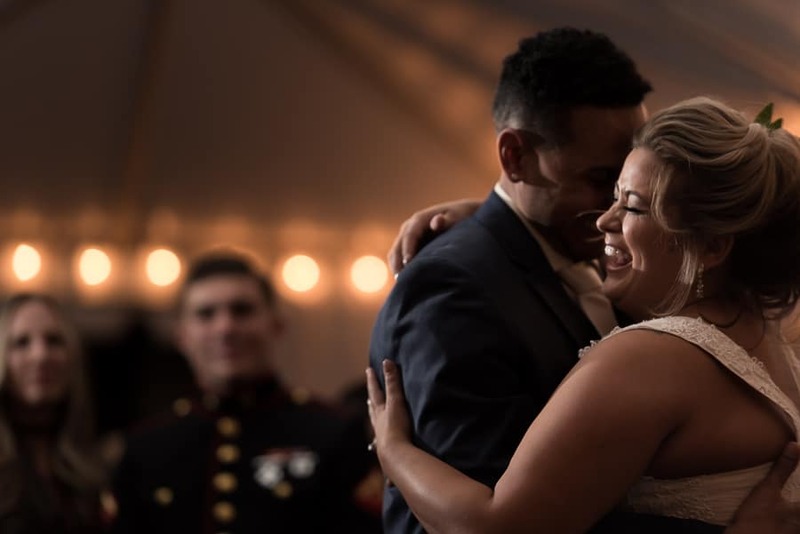 Surrounded by all their closest family and friends, they enjoyed their first dance to Elvis Presley’s Can’t Help Falling in Love. About midway through the song it changed over to the UB40 version of the song and the couple invited everyone onto the dance floor. It was tough getting everyone back into their seats because they were ready to dance! Before dinner was served, Alexis’ sister gave a toast where she read excerpts from her diary starting on the day Alexis was born. She even spoke about the time they went to camp and Alexis kissed some boy named Ron. Ron’s two cousins spoke next and both talked about how Ron is more of a brother to them than a cousin. 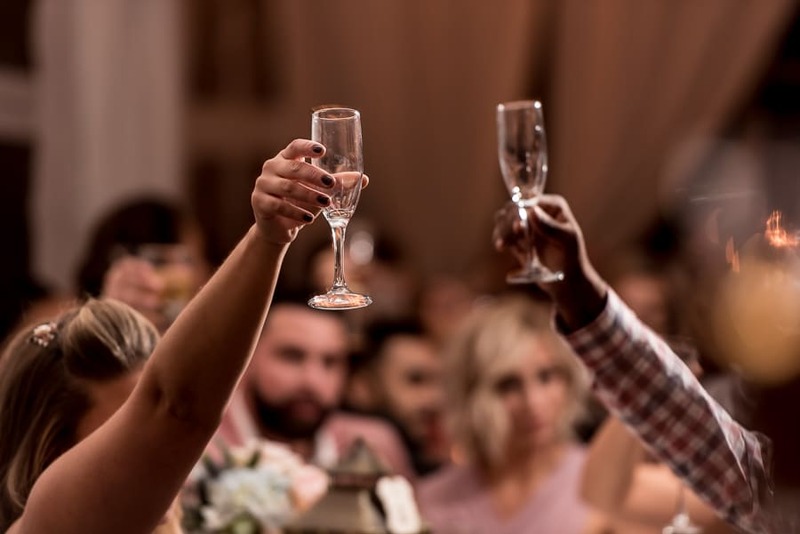 They offered words of advice, admiration and love for the couple, and one even sang a few lines with a very impressive voice. During dinner, Alexis and Ron snuck off to cut their cake in the Dining Room. 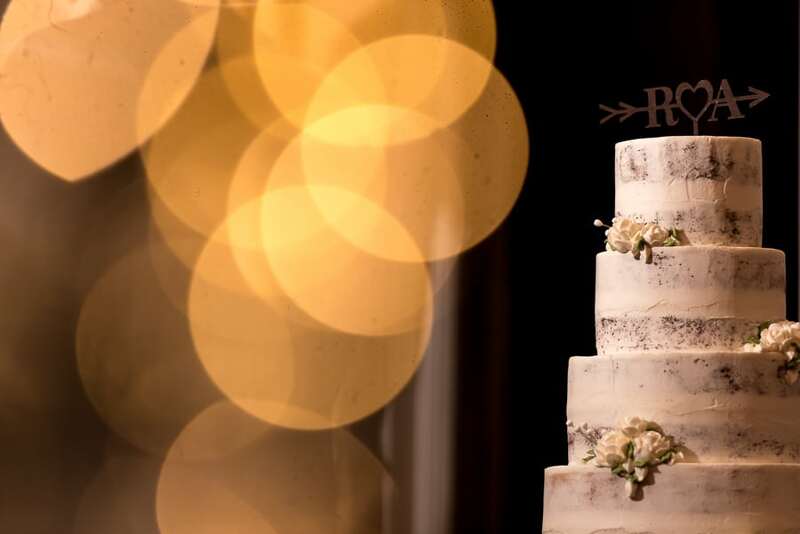 The barely naked cake by Master’s Baker was a sight to be seen! I loved the hint of sparkle mixed into the icing. After dinner, Alexis danced with her dad to Hero by Mariah Carey and Ron with his mom to Three Times a Lady by Lionel Richie. Finally the dance floor was officially open and it was packed! This group was having such a great time that it was hard to say goodbye. I really enjoyed spending the day at the Greystone Hall wedding venue with Alexis and Ron. They are obviously head over heels in love and that is always something I am happy to be part of and capture. Please enjoy the highlights and slideshow below. Please contact me to capture your love.